A handmade, handpainted (if required) kitchen should be seen as an investment. The way we make our kitchens means that other than normal wear and tear there is really no reason why the kitchen would not last 20 years plus. 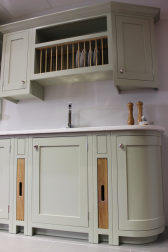 A hand painted kitchen can also easily be updated with a change of colour if the mood takes. Every carcass is made with Birch Ply - structurally the most stable product. The back of the carcass is housed in, glued and screwed. On the base units the bottom shelf (base) is housed into the gables by 10-12mm. For painted finishes, sub frames and doors are made with a hardwood called Tulip Wood which is very stable in heat. Sub frames are biscuit jointed and glued on the front carcass. 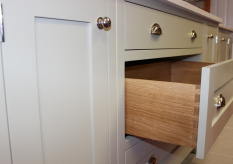 All of our drawer boxes are solid Oak and have traditional dovetail jointing for ultimate longevity. All doors and draws are put together using traditional mortice and tennon joints. Each drawer has soft-close runners as standard to ensure that it closes smoothly and silently every time. Working closely with our customer we will plan & design your dream kitchen. We have a wide range of accessories, racks and baskets to complement your kitchen. As we provide a totally bespoke service you will have full say on any choice of handles, colours and openings. Once a kitchen is commissioned and a deposit taken a full site survey will be undertaken to ensure that the space is filled in the most aesthetically beautiful way, taking into account any obstacles to ensure we never require the need for filler panels. At anytime during production you can, by appointment, call to the workshop to see progress being made. The kitchen will be delivered hand painted and once fitted a decorator will come in for a final paint and touch up.